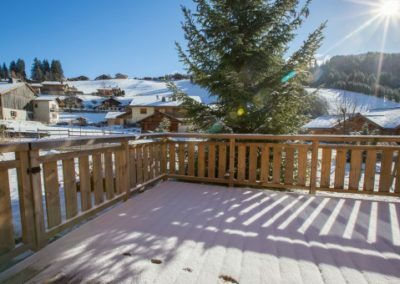 Ideally located for keen skiers, Chalet Mimosa les Gets is just a couple of minutes walk from Perrieres 6 man chair lift. 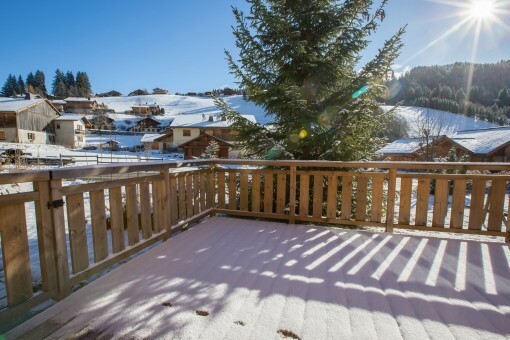 Additionally the town centre is a 5 minute bus ride or 15 minute walk, so the location couldn’t be better: fast access to Les Gets ski slopes, easy to get into town, but nice and quiet away from any late night noise once you’re back. 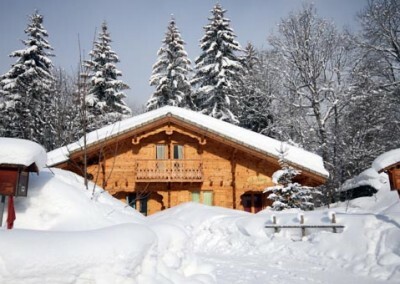 Chalet Mimosa has 3 bedrooms and 2 bathrooms and can comfortably sleep 7 people. 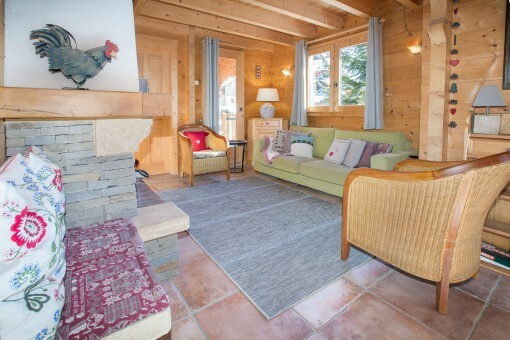 The chalet has been beautifully designed and furnished in a traditional alpine style. The open plan ground floor living area is a real home away from home. 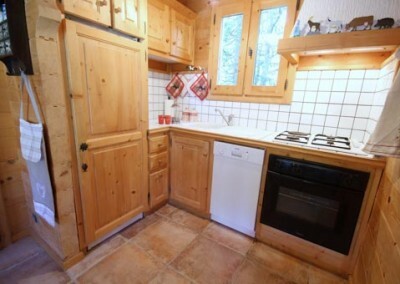 The well-equipped corner kitchen, with granite worktops, opens into the rest of the spacious living area, therefore the chef isn’t separated from the rest of the group. 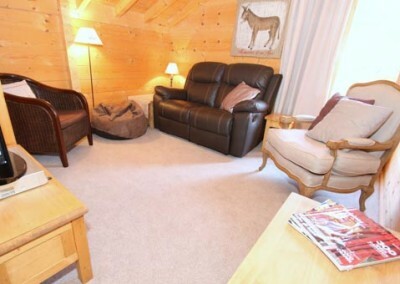 The dining area comfortably seats 7 people and leads onto a comfy seating area in front of the log fire. The only problem will be tearing yourself away from hot chocolate in front of the fire in order to get dinner on! There is also an additional seating area upstairs with a flat screen TV, English Sky TV, French channels and a DVD player. Plus of course WiFi is available. 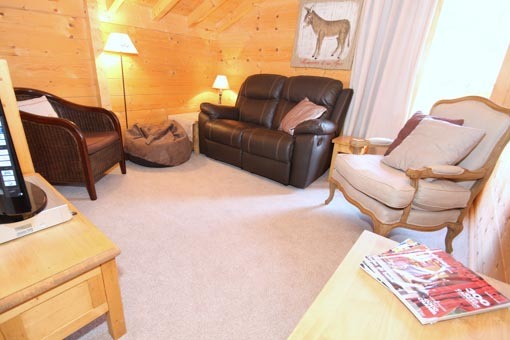 This space is ideal for keeping kids entertained, while grown ups enjoy a relaxed glass of wine in front of the fire. 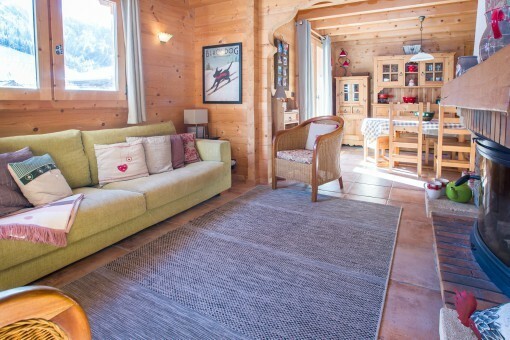 The chalet also has a garage with plenty of space for storing skis and boots, or mountain bikes. 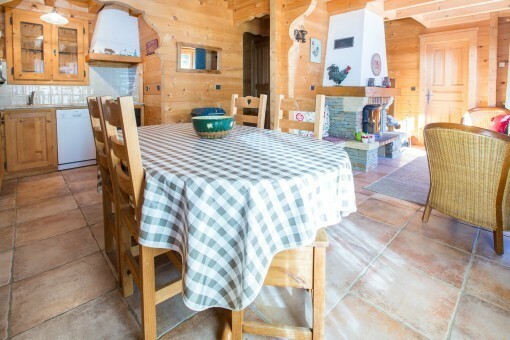 There is a large garden in front of the chalet and a huge wooden deck, ideal for sunbathing and outdoor dining in the warmer months. 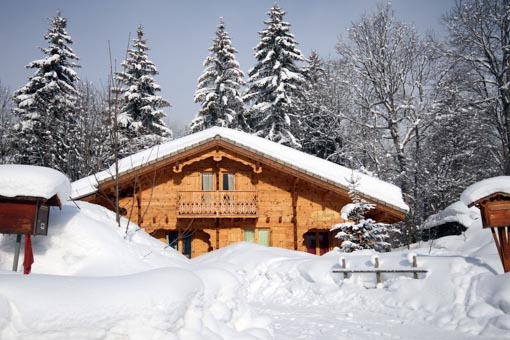 To the side of the chalet, there is a communal parking bay with space for one car and an additional space directly in front of the garage. One bedroom is on the ground floor and has 3 single beds, 2 of which can be made into a king-size double making this an ideal family room. 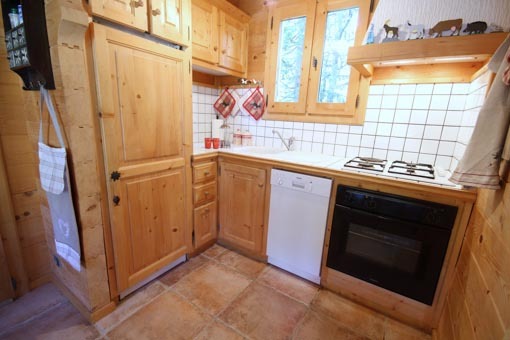 There are also large double doors leading out onto the wooden sun terrace at the front of the chalet. 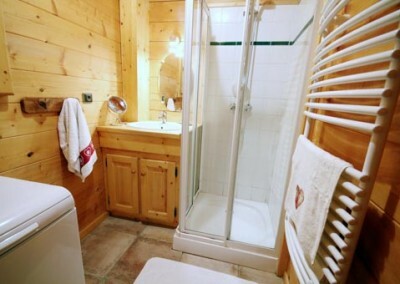 The adjacent shower room has been newly renovated in 2017, plus there is a separate toilet. 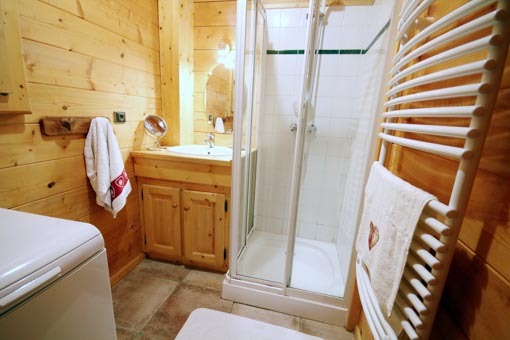 There is also a washing machine in the ground floor shower room. 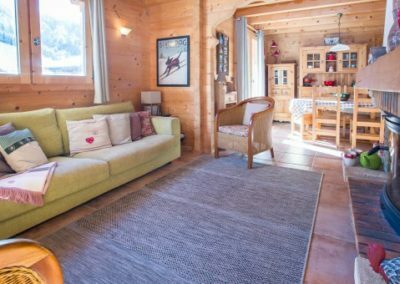 A large double room is on the first floor at the front of the chalet, with a glass door leading out onto the balcony with fantastic views. 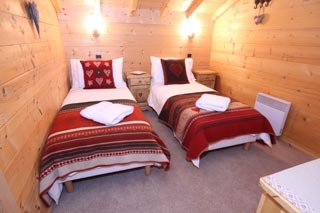 A twin room is also on the first floor, and can be made up as a kingsize double bed if preferred. 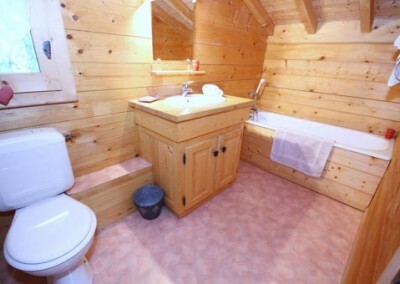 These two rooms share a spacious family sized bathroom. Jo will meet and greet you when you arrive and is always on hand to help with any questions you have. The chalet will be spotlessly clean for your arrival, and all beds made up. 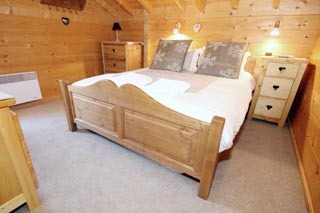 Ground Floor bedroom can be made up as a double bed and a single bed, or 3 singles. Windows open out onto the terrace. First floor double bedroom with balcony. First floor double or twin bedroom. 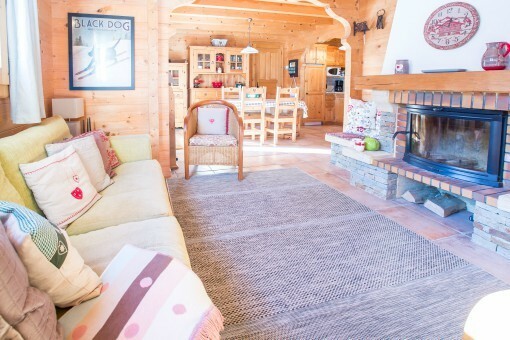 Chalet Mimosa is located in a quiet spot on the edge of les Gets. 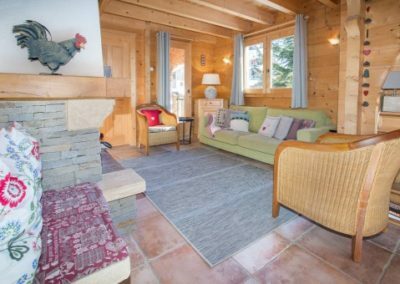 It is a couple of minutes walk from the Perrieres Express chairlift and there is a free ski bus that stops nearby to take you to the Chavannes. On foot, it is just a 10 minute walk into the village. 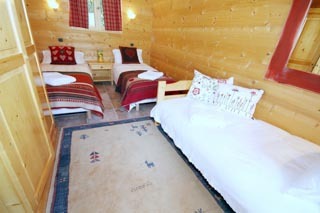 Another great year in our Mimosa Chalet! Can’t wait to come back. Great skiing, fabulous weather, completed by returning to our welcoming home; we love it here. Thanks Jo! Please get in touch if you would like more information on any of our properies or if you would like to make a reservation.